Two coins, one red and one green. Physically identical to the 2011 Silver Piece in all respects except color. Released for Christmas 2010 even though they are 2011 coins. Every month, the Munchkin Silver Piece rule changes, so go here to make sure you have the most current rule! (We put the URL right on the coins for your convenience.) The Christmas coins use this rule (but see rule 3, below). You may use BOTH Christmas coins during the game, once apiece, and you are not required to give up the Christmas coins even if the rule says you do. Rules 1 and 2 are suspended between December 25 and January 5. Instead, each coin is an unstealable one-shot item: the red coin's bonus increases from +1 on December 25 to +12 on January 5, and the green coin's bonus decreases from +12 on December 25 to +1 on January 5. 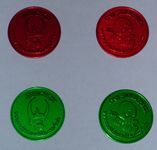 As an extra bonus, when you use the red Christmas coin, draw a face-down Door, and when you use the green Christmas coin, draw a face-down Treasure. You may put these in play immediately, even during combat.